The Congress has now demanded a CBI inquiry into all ration cards made in Chhattisgarh in the past six-seven years. The BPL ration cards which were made in large numbers in Chhattisgarh before the 2013 assembly elections, as reported by The Indian Express on Friday, was an exact repetition of the developments ahead of the 2008 polls. If it was the Food Security Act in the 2013 elections, in 2008 the poll plank of the Chhattisgarh BJP was the Mukhyamantri Khadhyanna Sahayata Yojna (MKSY), which gave the famous epithet of “Chaur wala baba” (old man with the rice sack) to Chief Minister Raman Singh. Before both the elections, BPL cards were made in a disproportionate number, bureaucrats raised the alarm, sought an immediate deletion of these forged cards, but the government decided otherwise. And in both cases, the state exchequer suffered heavy losses, running into several crores. The Congress has now demanded a CBI inquiry into all ration cards made in Chhattisgarh in the past six-seven years. While the government has admitted that forged cards were made, it claimed there was no malafide intention, cards were deleted by due process and there was no loss. “Enrollment of beneficiaries for ration cards is a continuous process unaffected by any external event including elections. The process of verifying ration cards is a long drawn affair as the government ensures that no rightful beneficiary is deprived of his food security,” Food Minister Punnu Lal Mohle told The Indian Express. The MKSY was launched in 2007 and instantly termed an innovative food scheme, under which the government created several categories of BPL ration cards and began distributing rice at Rs 3 per kg. Soon after the new ration cards were made under MKSY, then Food Secretary Dr Alok Shukla expressed grave concern over the sudden increase in BPL cards. “Therefore, it is imperative that these are verified, and if ineligible persons have made cards, they should be immediately cancelled. Complaints are also received that the cards were made for deceased persons and those who have left villages and cities. It has also emerged that at some instances the persons who run fair price shops have kept ration cards of people with them. It is necessary to identify and cancel such ration cards immediately,” Shukla wrote. He asked the officers “to send all the cancelled cards to the Directorate Food so that these cards are destroyed and removed from the database”. Noting that “the database has several mistakes”, he wrote that the department’s website has lists of such shops whose card details do not match those of the department. He ended the letter asking them “to finish the entire exercise in January itself”. A month before Shukla’s letter, Chhattisgarh then Food Minister Satyanand Rathiya informed the Assembly on December 4, 2007 that the state had 21 lakh BPL families. He emphasised that this is state’s own figure derived from its surveys, and noted that the Centre had identified merely 18.75 lakh BPL families in Chhattisgarh. The state’s figure exactly corresponded to what Shukla had pointed at in his letter — BPL families were around 21 lakh or 42 per cent of the state’s then around 50 lakh households. By then the state, however, had made 34 lakh BPL cards of several categories under the MKSY. Around 70 per cent of the state’s population, as Shukla had noted, was now eligible for cheap ration. To draw a comparison, just two months before the 2013 elections, this figure of BPL cardholders in Chhattisgarh reached 93.6 per cent under the Food Security Act. Within a week, however, the state government overruled Shukla’s concerns and, in a January 16, 2008 statement, Raman Singh announced that the government would continue giving 35 kg rice at Rs 3 per kg to 34 lakh poor families of the state. “Our expenditure on this scheme has now increased from Rs 350 crore to Rs 837 crore. 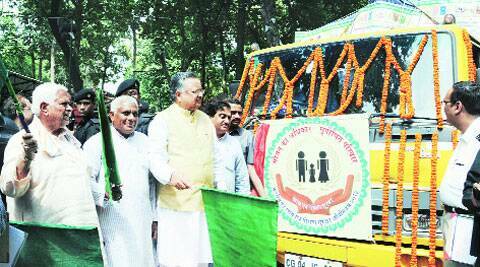 Irrespective of the hurdles we face, we pledge to give cheap ration to poor,” he had said. Shukla’s letter to “eliminate all fake cards in a month” was officially overridden by a government order of February 22, 2008, which ordered to “postpone the cancellation of cards of ineligible persons”. By then, 60,896 cards had been cancelled. However, it indicates that of 13 lakh BPL cardholders added under MKSY, about which Shukla had raised an alarm, only 1.4 lakh were deleted. PDS supply records also note otherwise. In the election year of 2008-09, PDS rice supplied to various cardholders under MKSY was 6.6 lakh MT. In 2009-10, rice supply under the scheme reduced drastically by 1.9 lakh MT or 28.7 per cent to 4.7 lakh MT, indicating a decline in the number of beneficiaries. Considering that the economic cost of rice then was Rs 19,000 per tonne, 1.9 lakh MT amounts Rs 361 crore. Add to it the amount of subsidies on other food items, Chhattisgarh’s additional food subsidy in election year suddenly increased by Rs 460 crore, roughly the amount Raman Singh pledged to earmark for the scheme. In comparison, the government lost anywhere between Rs 1,400 crore and Rs 3,200 crore over the BPL cards made for the 2013 Food Act. Mohle, however, said there was no loss and the government has postponed all cancellations this year.